Collect faster and better or in other words, reduce your DSO. What is the meaning of the initials DSO? DSO ratio (Days Sales Outstanding) is a measure of the average number of days that a company takes to collect revenue after a sale has been made. A low DSO number means that it takes a company fewer days to collect its accounts receivable. A high DSO number shows that a company is selling its product to customers on credit and it takes longer to collect money. What is the importance of this ratio? To get a quick idea of its importance, let me take a very simple example: Suppose that the annual turnover of a company is € 3.6 million and its daily sales figure is 10,000 € (€ 3.6 million / 360 days). Suppose further that the current DSO is 50 days, so that the amount that the company invests in receivables would be 500,000 € (50 days x € 10,000 / day), which is exclusively dedicated to their customers financing. In order to perform this financing, the company needs to collect resources to undertake other activities, for at least its fixed value, but, with a cost of 10%. In short, carrying their customer financing represents 50,000 € (€ 500,000 x 10%). If the DSO is reduced in 40 days, financing costs would be reduced by 10,000 €. Taking into account these figures, DSO ratio becomes relevant. 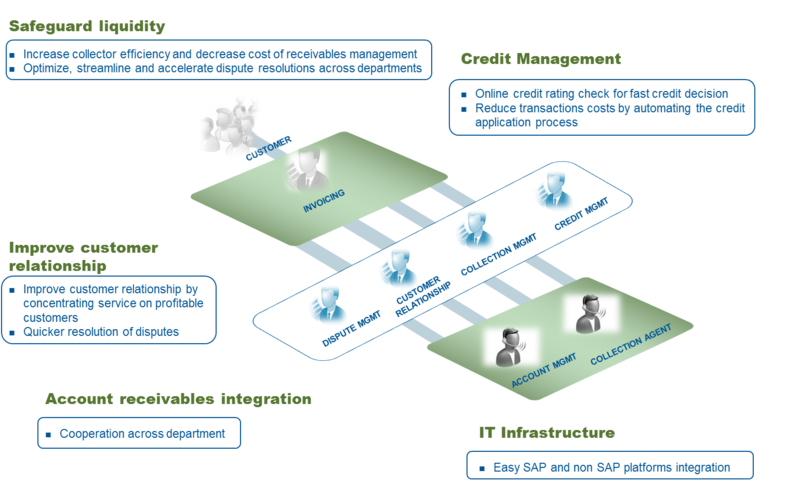 How the Receivables Management SAP solution can help the companies to reduce their DSO? Dispute management responds to the current necessity for companies to clarify the reasons when an invoice is not paid. Nonpayment, or partial payment are not always caused by client's refusal, it can be due to different causes, depending on the business sector. What kind of circumstances could generate delays? Incorrect billing or contact addresses, inadequate logistics (a product has not been delivered on time) or incomplete service, among others. In the current situation of lack of liquidity, companies cannot afford a non-collected invoice due to a simple problem in the supply chain or billing, so we have to clarify in a very short time, the reasons of an unpaid invoice. SAP Dispute Management supports the processing of receivables related on disputes or clarification cases. Sometimes happens that customers do not notify their suppliers about payment reductions or nonpayment, that´s why many vendors must deal with huge numbers of payment deductions or delays. In other cases the companies pay on time but the collected amount does not agree with the billed amount. SAP Dispute Management application enables us to solve more effectively customer disputes over receivables. This tool can help us to improve the tracking and processing of short payments, streamline our accounts receivable processes and enhance our customer relationships. We can manage each dispute according to specific reason codes, such as price discrepancies, quantity or damaged goods, and route them to the appropriate employees via workflow. All information related to each case is contained in a centralized file called dispute case. This file enables all employees involved in the clarification case view critical information such as the reason code, disputed amount, partial payments, communications history and current status. In a single view, you can see the reason code, processor, disputed amount and amount paid. You can also see all actions that have been taken to resolve the dispute, as well as all customer correspondence. The main benefits of this solution are: avoiding companies to waste significant resources, collection costs reduction, facilitating cooperation across departments and DSO decreasing. SAP Collections Management helps you proactively to manage and collect overdue receivables. The software uses a collections work list with an overview of each past-due account, including open invoices, dispute cases and contact history, ensuring that collections agents have all the information they need when contacting a customer. In addition, agents can easily document the results of each customer contact and create promises to pay. Efficient receivables management has become critical for many companies in a difficult economic environment, where classic dunning notices may no longer be effective with customers. Analysts estimate that efficient receivables management can help companies reduce DSO by 20% to 10%. Agents and analysts can identify accounts that require more attention based on receivable value, name of customer or DSO. SAP Collections Management lets you check customer accounts directly through a collections work list. The work list provides an overview of all the information you might need when contacting a customer. The customer collection view shows all open invoices, including their current status, as well as all open promises to pay and dispute cases. You can also display a history of each invoice, along with any related promises to pay or dispute cases. In addition, the application lets collections agents document the results of customer contacts. An agent can, for example, create a promise to pay and track it later. Promises to pay that customers do not fulfill automatically receive a status of “broken” or, if the payment received does not correspond to the amount indicated it receives the status of “partially kept.” Agents can also create dispute cases or provide information about the status of existing cases. ConVista Spain has implemented the Receivables Management SAP Solution on Utility and Insurance companies during the last year helping them to improve their DSO ratios. Experience acquired in the previous projects has helped us considerably to improve our knowledge in the functioning of these modules, giving us also the ability to develop Receivables Management RDS projects.